This tutorial shows you Servlet Redirect HTTP Request Example that demonstrate an HTTP Request from one servlet to another servlet. The sendRedirect() method of the HttpServletResponse sends a temporary redirect response to the client using the specified redirect location URL and clears the buffer. 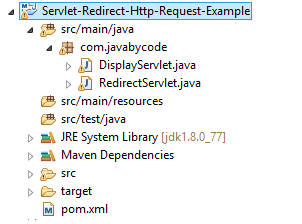 This is ninth post of series of Java Servlet Tutorial. This series tutorial will provide you full knowledge about Servlet 3.0. To perform a permanent or temporary redirect in a Servlet, set the status property of the HttpServletResponse object to either SC_MOVED_PERMANENTLY (301) or SC_MOVED_TEMPORARILY (302) and set the Location header to the target URL. The sendRedirect() method of the HttpServletResponse sends a temporary redirect response to the client. This redirect sets the status property to 302. It means that this redirect is temporary. Deploy file war on a servlet container or application server( Tomcat 8 for example) then run with the address.